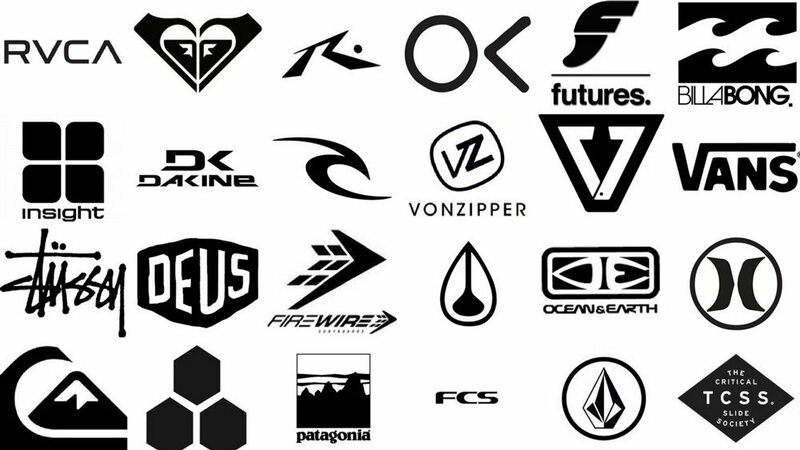 Surf brands and A/E/C firms compete in crowded markets. Surf brands do a great job carving out distinct brand identities to differentiate their surfboards, board shorts, and wetsuits. 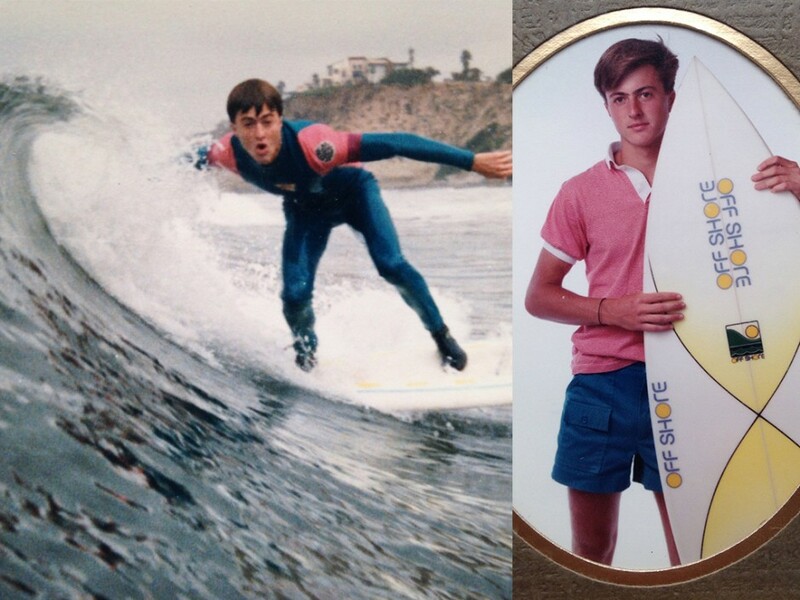 David Lecours, surfer and A/E/C branding consultant, will share examples of cutting edge graphic design, iconic people, founding stories, messaging, and archetypes that help surf brands and A/E/C firms stand out from the pack. You’ll return from the conference ready to shred with new techniques. Expect a wave of improvement in your SOQs, proposals, websites, presentation decks, videos and advertising. To download the slides, click the LinkedIn logo (“˜in’ square above). Within Slideshare, click “Download” button under the title. Lately, I hear a lot of A/E/C firms talking about culture. When competing for talent, firms often cite their culture as a differentiator to lure new hires. I define culture as the shared behaviors and beliefs of your firm. So, how do you share your culture with a prospective hire or client? Don’t they have to experience it? First, codify the shared behaviors and beliefs of your firm as written Core Values. Sadly, most firm leaders develop a set of banal Core Values at a weekend retreat, then send them out in an equally uninspired mass email to all employees. But, as you’ll see in this post, Core Values can be so much more. A creative manifestation of your Core Values is a powerful marketing tool and an essential artifact of your culture. An artifact that prospective hires or clients can experience to determine if there is a match. Prospective hires and clients want to get a sense of what it’s like to work with your firm. They imagine themselves on a typical day at your office and judge whether they’ll fit in. Simultaneously, you want clients and talent that harmonize with your culture. For both parties, this requires a leap of faith. But you can minimize the risk by sharing a creative manifestation of your Core Values. The goal isn’t to create something safe that resonates with everyone. You only want people who fit with your culture. Communicate your point of view. Then let clients and talent self-select. 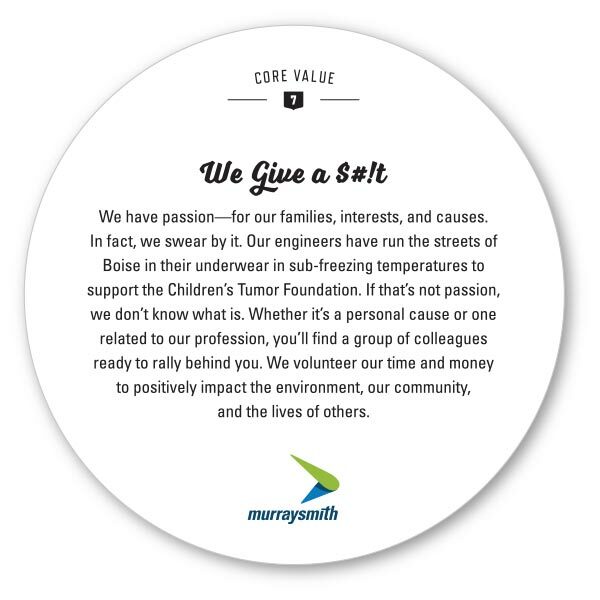 Here is an example of Manifested Core Values we recently created with our client, Murraysmith. First, we helped them with their positioning: geographical focus on the Northwest, obsession with detail/quality, fun, and the right size (120 people). Sounds like like a craft brewery, right? So, we decided to invent a faux craft beer for each of their seven Core Values. Each Value became manifested as a letterpressed (a craft printing technique) beer coaster. The Core Value is on the front, with a description about what it means on the back. 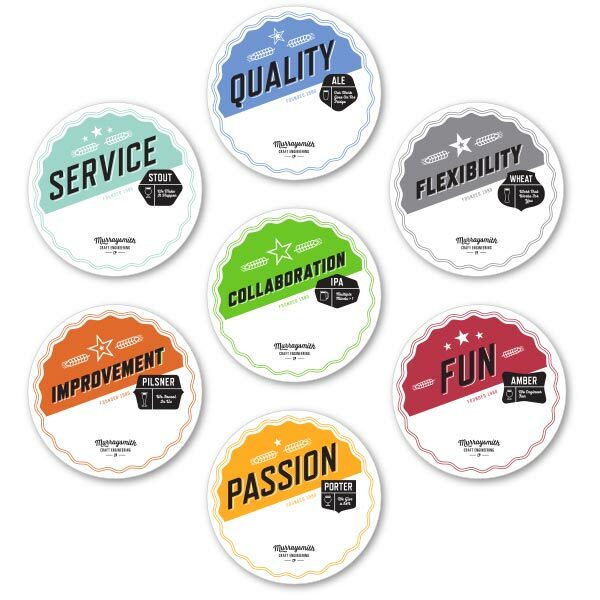 To give each Value the gravitas it deserved, and to create a sense of anticipation, we recommended one new coaster be distributed to each employee for seven consecutive weeks. Most firms have a particular way they like things done. Everything from how to bind a proposal, close out a project, or even write an email. Some firms even develop a clever name or use The (Firm Name) Way to brand their culture. I suppose you could create a 10-volume employee manual that imagines all scenarios employees will encounter. Or, you could manifest your Core Values as a guide to allow employees, who are adults, to use their best judgement. I recommend the latter. 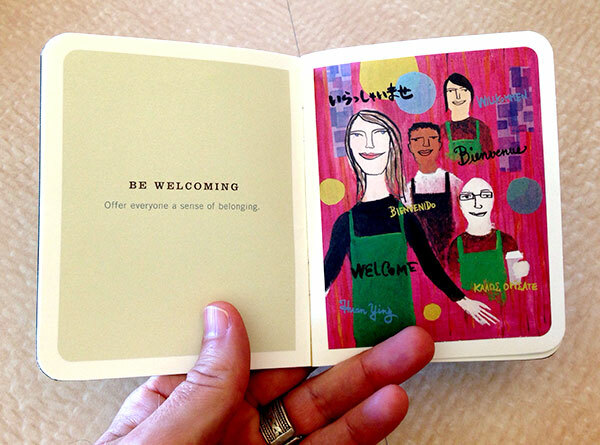 Starbucks manifests their Core Values in their Green Apron Book. 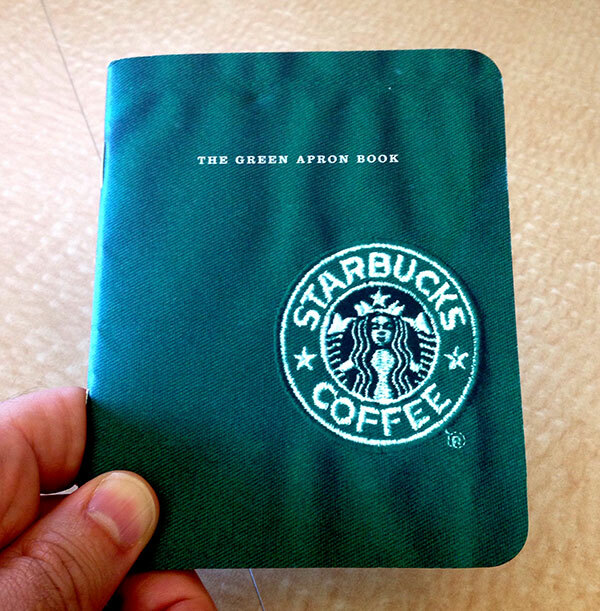 As you can probably infer, it’s pocket-sized to fit in a barista’s green apron. I like to think the pocket position (over the heart) helps baristas takes the expected behaviors to heart. Below are more ways to manifest your Core Values. 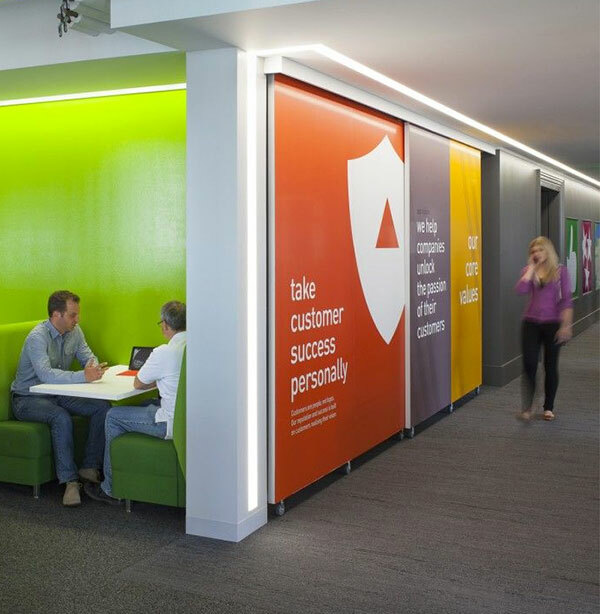 You could design and print oversized graphic panels to cover boring blank walls within your office. 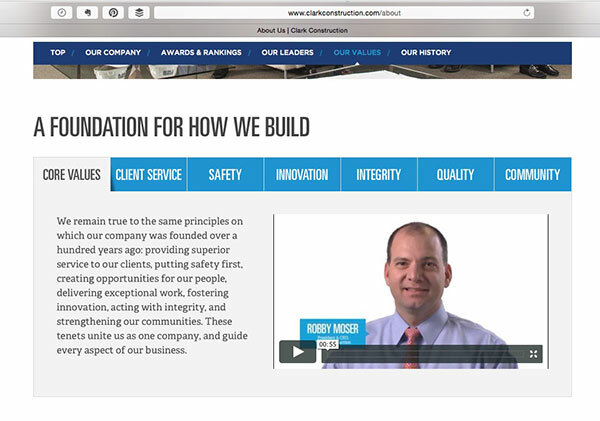 Clark Construction shares their values through a series of videos on their website. Each video summarizes one value with different employees sharing what that value means to them. You could hire a designer to create an infographic or poster as shown below. They took an acrostic approach where R-I-S-E are the first letters in their four Core Values. When you bring your Core Values to life, do so in a medium that reflects your culture. 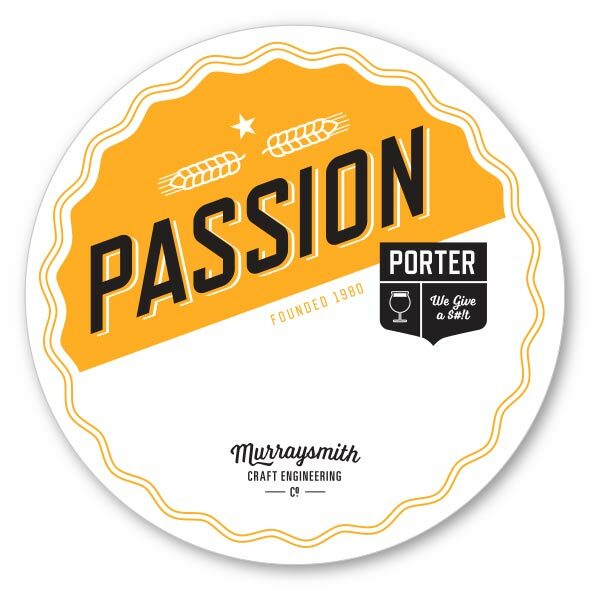 Many employees at Murraysmith go out after work and enjoy the burgeoning craft brewing culture of the Pacific Northwest. So, beer coasters were a great fit to communicate the firm’s Core Values. As Marshall McLuhan stated, “the medium is the message.” Choose a medium that fits your firm. To effectively pass culture on to the next generation in your firm, it must be manifested. You can’t rely solely on oral tradition. Stories get lost, skewed by the teller, and forgotten by the listener. Share your Core Values and culture through a tangible artifact. When the right prospective client or employee experiences your Manifested Core Values, a fierce loyalty will develop. How does your firm creatively manifest Core Values? Please leave a reply. 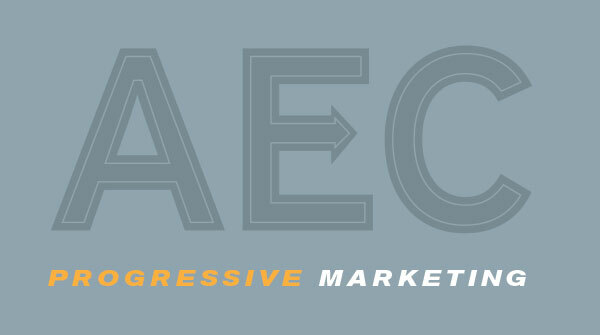 This post is the first in a series highlighting progressive marketing from A/E/C firms and leaders. How do I define progressive? Firms that are marketing proactively, not simply reacting to RFPs. It’s leaders developing, sharing, and archiving their knowledge as experts. Progressive firms believe that relationships can, and do, begin online, so they are fluent in digital marketing. Progressive firms embrace human-centered marketing with emotional intelligence, and the vulnerability of creative risk-taking. 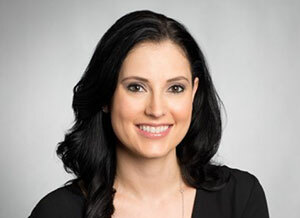 I chose to interview Nicole La, Experience Director at TEECOM, because of their progressive marketing to clients and talent through experience design. TEECOM provides “the tech in architecture.™” We provide integrated telecom, audiovisual, acoustics, security, network and wireless technology design for clients including building owners, tenants, architects, engineers, and contractors. We work in many sectors with a common theme of improving the experience of people using our clients’ buildings. Of course we want our clients to be happy, but really we are advocates for the people that live, work, learn, heal, and perform in the buildings that our clients design and build. We are 90 people, with offices in Oakland, Dallas, Portland, and Brighton, United Kingdom. Tell me about your title, Experience Director. I set strategy for our firm’s hiring, marketing, and internal continuing education efforts. I focus on the employee and client experience enabling TEECOM to continue to evolve toward true innovation. So, not just marketing to win new clients, but also marketing to win and retain talent? Yes, it’s crazy how most firms leave recruiting and retention to only Human Resources when the Marketing department typically knows the brand best, and how to persuasively tell the firm’s story. How did your role evolve? A year ago, our CEO asked me to take over talent recruiting. At first I was resistant because it was unfamiliar territory. But the more I thought about it, recruiting is simply marketing for people. I didn’t want to give up marketing to clients, so our CEO and I brainstormed about how we could make it work. Part of our solution was to hire a Marketing Manager for proposals to free me up to embrace my new responsibilities. How did your firm begin with experience design? Leaders in the firm read The Experience Economy by Pine and Gilmore, and it changed the culture of our firm. The book promotes a new way of thinking about connecting with clients and talent (employees) to win their loyalty. Simply selling services is no longer enough. Leading firms stage experiences that enhance the value of their services. How did TEECOM start implementing experience design? Good question, because in our first year, before we rolled this out to the client experience, we focused on the employee experience. We did an experience mapping exercise starting with job candidates learning about TEECOM, to the interview experience, through the hiring process. New hires receive a playful “Welcome to TEECOM” handbook that is customized for that person. It is not a full-on employee handbook, but rather a customized welcome to the team, complete with maps, Yelp reviews of local services, and all-important local restaurant reviews. What are some things you are doing to enhance the employee experience? New employees are greeted at their desks by a gift of branded materials that they have personally chosen through our online store. We recognize employee accomplishments such as obtaining certifications or anniversaries on our general Slack channel and in our monthly all-hands meetings. We post employee kudos on digital signage throughout the office. Each employee receives a FitBit and we host wellness programs for the mind and body, branded as TEECOMfit. All employees have a mentor with whom they meet regularly to set specific career goals and, if they want, personal goals. We are currently launching TEECOMuniversity, an internal continuing education program open to all employees, which gives a formal structure to our ongoing knowledge shares. As a technology company, how do you use technology to measure internal experience? We don’t use email for internal company communication. Instead, we use Slack, a cloud-based team collaboration tool. Within Slack, employees receive a weekly pulse survey via Officevibe with five simple questions about how things are going at work. Feedback is delivered anonymously to management in an engagement report with suggestions for improvement. We also use a platform called Small Improvements to conduct quarterly 360 Reviews for continual feedback and improvement. What about marketing for the client experience? We had already been helping our clients to map the experience of their building users, so it made sense that we would map the experience of our own clients from beginning to end. We developed a set of guidelines for the business development and proposal experience outlining everything we need to do to win great clients. We elevate ourselves as pursuit team members by responding quickly and providing materials that go above and beyond the basic request. We help clients along their decision-making process by creating articles and videos to educate and inform them about how technology’s evolution will impact their projects. Our guidelines for project management describe behaviors shaped by our firm values: demonstrating that we care, maintaining trust, and finding ways to add value. We typically measure the client experience through direct feedback at dinners and events with clients. Nicole and TEECOM are a great reminder that A/E/C firms aren’t simply selling services, we are selling a complete experience. The sum of these experiences equal our reputation, aka brand. This reminds me of the famous Maya Angelou quote, “People will forget what you said, people will forget what you did, but people will never forget how you made them feel.” Make people feel great throughout the journey of your firm, and you’ll develop fierce loyalty. As TEECOM’s website declares, “our clients demand innovation.” It’s great to see the firm practicing what they preach by embodying innovation in their marketing approach. If your firm is ripe for this approach, start small with a single client or employee experience that you can master. Then, build on that momentum for a more comprehensive approach that will hopefully become integrated into your culture. To learn more, below are some resources. Why – Why Have a Website?, Why This Session? Why this session? Why have a website? Wipeout: The gnarliest mistakes online today. What – What Is The New Wave Of Websites? A new wave is on its way””are you ready to ride? 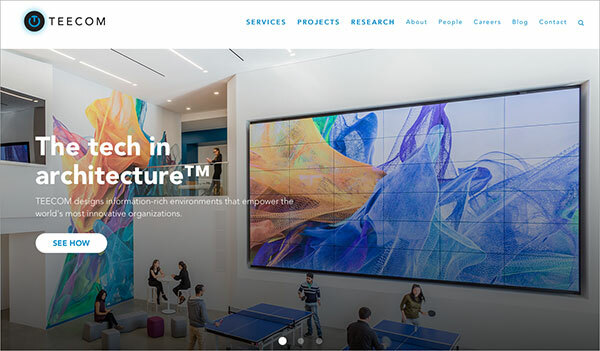 What’s NEW for AEC websites? Ding Repair (fix it up) or New Board (whole new website)? Measurement: How long? How much $? I rec­om­mend To Sell Is Human by Daniel Pink to any­one in the A/E/C industry because, as the book says, “we’re all in sales now.” Many A/E/C firms claim that “every­one in the firm sells,” but they rarely offer sales train­ing. This book fills that knowl­edge gap, even for those that don’t think of them­selves as salespeople. 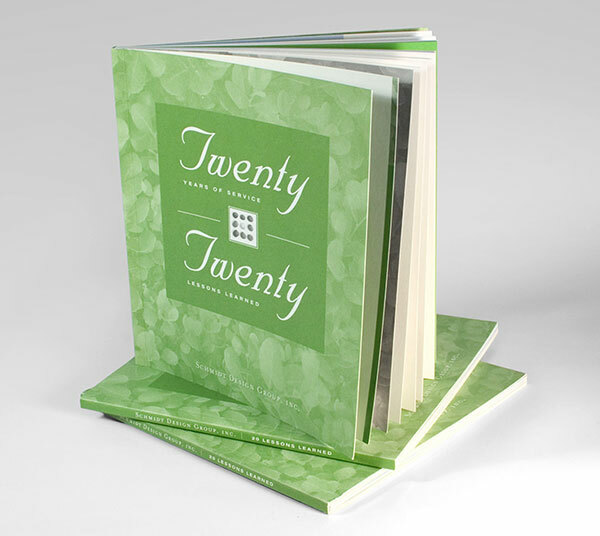 This sum­mary high­lights the why, what, and how to apply the core con­cepts of the book. 1) Like it or not, we’re all in sales now. 2) Sales has changed more in the last 10 years than in the pre­vi­ous 100. ABC used to stand for Always Be Clos­ing. Accord­ing to Pink, ABC now refers to Attune­ment, Buoy­ancy, and Clar­ity. Attune­ment “” The capac­ity to take someone’s view and cal­i­brate your words and actions to match. Pro­pos­als and Pre­sen­ta­tion Inter­views need to be attuned to our buyer’s chal­lenges. If the RFP is writ­ten using spe­cific lan­guage, then selec­tively adopt that lan­guage in your response to demon­strate an under­stand­ing of their challenges. Buoy­ancy “” The capac­ity to stay afloat in “an ocean of rejec­tion.” After pur­suit losses, Pink rec­om­mends inter­rog­a­tive self-talk. Dur­ing your next go/no go delib­er­a­tion, inter­ro­gate your­self. Ask “can we deliver this project with excel­lence? If yes, then list the top 5 rea­sons why. Use these 5 rea­sons inspire your pro­posal and presentation. Clar­ity “” Mak­ing sense in murky sit­u­a­tions. Pink defines this as prob­lem find­ing, then prob­lem solv­ing. Teams that win fre­quently make rec­om­men­da­tions about poten­tial project prob­lems that the client hadn’t even considered. Pitch, Impro­vise and Serve are how to apply the new ABCs of sales. Pitch “” Sum­ma­riz­ing the essence of your project pur­suit into a mem­o­rable tagline or phrase can help your mes­sage stick. Accord­ing to Pink, rhyming “taste great and goes down eas­ily.” A great resource to help with rhymes isrhymezone”‹.com. Story is another bril­liant way to pitch. Story is mem­o­rable, pow­er­ful, and emo­tional. Big deci­sions are made on emo­tion, then later jus­ti­fied with fact. Impro­vise “” To Sell is Human reminds us that there are three main rules in Improv. Hear offers, say “yes and,” and make your part­ner look good. Being a great mar­keter means being a great lis­tener. 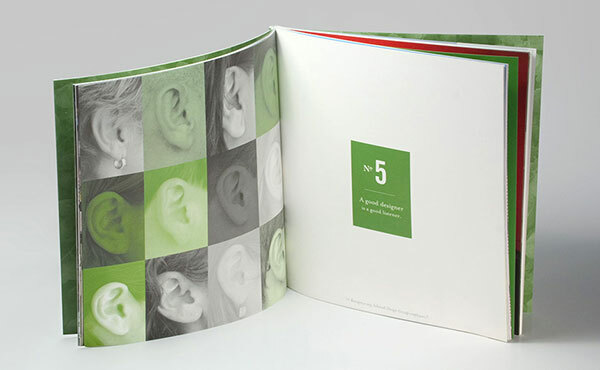 Mak­ing your part­ner look good can be directly applied to pre­sen­ta­tion inter­views. Not only are selec­tion pan­els lis­ten­ing for what you say, but they also observe how your team inter­acts. Mak­ing fel­low team mem­bers look good com­mu­ni­cates that you will make your client look good. Serve “” Pink reminds us to make our work both per­sonal and pur­pose­ful while serv­ing oth­ers. By under­stand­ing your client’s per­sonal hopes, dreams. fears and inse­cu­ri­ties, you will offer bet­ter solu­tions. Also, ask why a pur­suit mat­ters to you and your team. Then share your answers in pro­pos­als and inter­views. If your pur­pose for pur­su­ing a project improves qual­ity of life or improves the world, then your team now has an inspired mission. Do you enjoy attending conferences as much as I do? Meeting new people, exposure to new ideas and idealism are all infectious. But a week after the conference is over, what really sticks with you? Is your investment of time and money worthwhile? 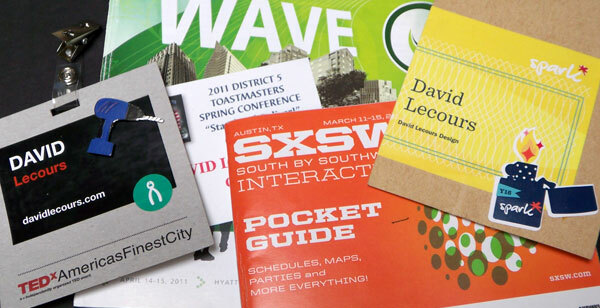 Here are 8 Tips for marketers to get the most out of attending your next conference. It’s tempting to only attend conferences where your tribe gathers (fellow marketers, architects, engineers, etc.). This can be good for teaming, but also choose conferences where potential clients gather. Ask your current clients, in your targeted industry, which conferences they attend. Then consider who the speakers and attendees will be. I’ve found that regional conferences like SMPS The Wave offers more intimacy and a higher concentration of potential clients than national conferences. A great way to build brand awareness for yourself and your firm is to be visible at a conference. The best way to do this is get on the agenda as a presenter. Start with being a panelist in a breakout, then a sole presenter. Move your way up the food chain to be a panelist or keynote speaker in a main session. Conferences typically put out a request for presenters at least 6 months prior to the event. Another great way to build visibility at a conference is to be a sponsor (but only if this allows for personal introductions to VIP organizers or attendees). Consider volunteering to help organize the conference in a way that allows you to demonstrate your talents, or develop a new skill. In short, connect yourself to the conference to benefit from the halo effect. Conferences always announce speakers before the event as a marketing tool. Determine which speakers you would like to meet and start following them on Twitter or subscribe to their newsletter. Help to promote their session at the conference by tweeting something like “I’m excited to learn from @lecoursdesign at the @SMPStheWave conference.” Genuine flattery will make you more memorable when you actually meet the speaker at the conference. The previous tweet also helps to promote the conference itself which might gain you an extra drink ticket from your new friend, the conference organizer. Conferences will often pre-announce attendees. This is a great opportunity to reach out to those you’d like to meet. Pre-arrange meeting for a meal, or for coffee during a break, because nobody likes being that lonely guy standing around trying to look occupied. Once the conference starts, it’s easy to simply follow the herd. But you need to be selfish to make sure your needs are met. Get clear on why you are attending a conference before you register. This can be your purpose. Then set some goals that will support that purpose. For example, you may want to meet 5 new client prospects, gain 3 new blog ideas, or find 2 potential teaming partners. Look through the conference agenda to make a tentative schedule for the sessions and breakouts you prefer to attend. Then be flexible enough to adapt when Seth Godin asks you to lunch because you pre-conference tweeted about his session. I am migrating from taking handwritten notes in a notebook to using a laptop, and eventually a tablet. My handwriting can be illegible and I often use my notes as content for this blog so going digital is more efficient. By capturing your notes digitally, you eliminate the intermediary step of having to transcribe your notes. This increases the shelf life of that content. For visuals, use your smart phone or digital camera to capture key slides of a presentation. Digital video or audio capture is another great way to make sure you don’t miss a word. It’s been said that you don’t really know a subject until you teach it to someone else. A great way to digest the knowledge you consumed at the conference is to share it with others. Those that weren’t able to attend the conference will appreciate this. Those that did attend will appreciate a review, and also hearing about alternate breakout sessions that they were not able to attend. One way to share is to live tweet those nuggets of wisdom your followers would appreciate. Or, share a blog post about individual sessions or highlights of the entire conference. A big motivation for me to attend conferences is to meet new people. But as an introvert, this can be challenging. Introducing oneself is awkward for most people. An effective icebreaker is to ask “what did you think of the previous speaker/session?” or “what’s the best thing you’ve heard at this conference?” There is no doubt that you’ll be asked “what do you do?” or “where do you work?” Have a self introduction that is intriguing enough that people will ask follow-on questions. For more info on writing a good self introduction, click here. A final tip is to eat lunch with people you don’t know. One of my best friends today is someone that I met at lunch at a conference over five years ago. Conferences can be physically, mentally and emotionally tiring. Sleep on the plane or when you get home. Seize every opportunity that the conference offers to get a full return on your investment. Some of the best conversations and connections get made around the periphery of a conference. I’m still kicking myself for not joining a group going out after SMPS The Wave. I missed out on a live mermaid swimming in a giant tank. It even inspired Josh Miles to write a great post How a Mermaid Got Me Talking About a Brand. I hope these tips are useful for you to get the most out of a conference. What have I missed? What are some strategies you use when attending a conference?